The word genocide, was first created in 1944. It's defined as, a horrific crime of violence and basically just plain cruel. 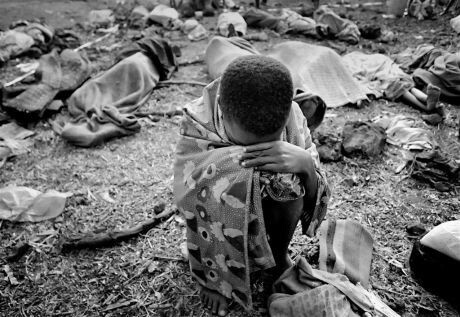 When Rwanda started to have genocide in its country, the UN tried to stop it. Unfortunately they failed and were ashamed of their failure. Most of the attacks were/are meant to destroy all or part of a race, ethnic group, or a religion. Some villages had a chance to forgive them when they were caught but of course who would forgive people who've done such nasty crimes. Like in this picture you will never know who is a part of these groups. It might even be your best friend. Millions have are going through these horrible attacks. United to end genocide was founded in 2004. Their mission is to end genocide so it won't become a usual thing. They are helping send medical supplies over to heal the ones that are attacked and they give security to prevent it from happening. They made a promise that is also their logo "never again." When they say that they mean that they will make sure that there is not another holocaust. Their logo is "never again"
They of course take donations and will take volunteers you simply just need to fill out a flyer. 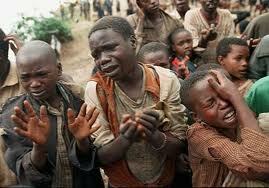 If you donate, about 90% of it will be used for their cause which is to end genocide. They get most of their money from those donations so they definitely need a lot. 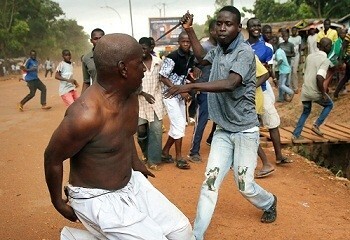 The volunteers get to go to that place and use that money to end the genocide in that area. Click here for the link if you want to comment, question, or have a connection.